Implement the interfaces provided by the plugin. Build the plugin using an adequate .pro file. We start by including interfaces.h, which defines the plugin interfaces for the Plug & Paint application. For the #include to work, we need to add an INCLUDEPATH entry to the .pro file with the path to the header file. The BasicToolsPlugin class is a QObject subclass that implements the BrushInterface, the ShapeInterface, and the FilterInterface. This is done through multiple inheritance. The Q_INTERFACES() macro is necessary to tell moc, Qt's meta-object compiler, that the base classes are plugin interfaces. Without the Q_INTERFACES() macro, we couldn't use qobject_cast() in the Plug & Paint application to detect interfaces. For an explanation for the Q_PLUGIN_METADATA() macro see Exporting the Plugin. In the public section of the class, we declare all the functions from the three interfaces. Let's now review the implementation of the BasicToolsPlugin member functions inherited from BrushInterface. The brushes() function returns a list of brushes provided by this plugin. We provide three brushes: Pencil, Air Brush, and Random Letters. On a mouse press event, we just call mouseMove() to draw the spot where the event occurred. In mouseMove(), we start by saving the state of the QPainter and we compute a few variables that we'll need later. If the brush is Pencil, we just call QPainter::drawLine() with the current QPen. If the brush is Air Brush, we start by setting the painter's QBrush to Qt::Dense6Pattern to obtain a dotted pattern. Then we draw a circle filled with that QBrush several times, resulting in a thick line. 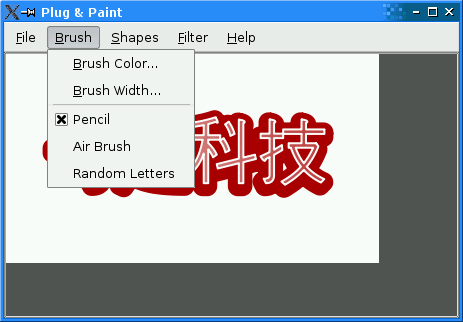 If the brush is Random Letters, we draw a random letter at the new cursor position. Most of the code is for setting the font to be bold and larger than the default font and for computing an appropriate bounding rect. At the end, we restore the painter state to what it was upon entering the function and we return the bounding rectangle. When the user releases the mouse, we do nothing and return an empty QRect. The plugin provides three shapes: Circle, Star, and Text.... The three dots after Text are there because the shape pops up a dialog asking for more information. We know that the shape names will end up in a menu, so we include the three dots in the shape name. A cleaner but more complicated design would have been to distinguish between the internal shape name and the name used in the user interface. The generateShape() creates a QPainterPath for the specified shape. If the shape is Text, we pop up a QInputDialog to let the user enter some text. The plugin provides three filters: Invert Pixels, Swap RGB, and Grayscale. The filterImage() function takes a filter name and a QImage as parameters and returns an altered QImage. The first thing we do is to convert the image to a 32-bit RGB format, to ensure that the algorithms will work as expected. For example, QImage::invertPixels(), which is used to implement the Invert Pixels filter, gives counterintuitive results for 8-bit images, because they invert the indices into the color table instead of inverting the color table's entries. To finally export your plugin you just have to add the Q_PLUGIN_METADATA() macro right next to the Q_OBJECT() macro into the header file of the plugin. It must contain the plugins IID and optionally a filename pointing to a json file containing the metadata for the plugin. Within this example the json file does not need to export any metadata, so it just contains an empty json object. To make the plugin a static plugin, all that is required is to specify static in addition to plugin. The Extra Filters plugin, which is compiled as a dynamic plugin, doesn't specify static in its .pro file. The TARGET variable specifies which name we want to give the target library. We use pnp_ as the prefix to show that the plugin is designed to work with Plug & Paint. On Unix, lib is also prepended to that name. On all platforms, a platform-specific suffix is appended (e.g., .dll on Windows, .a on Linux).